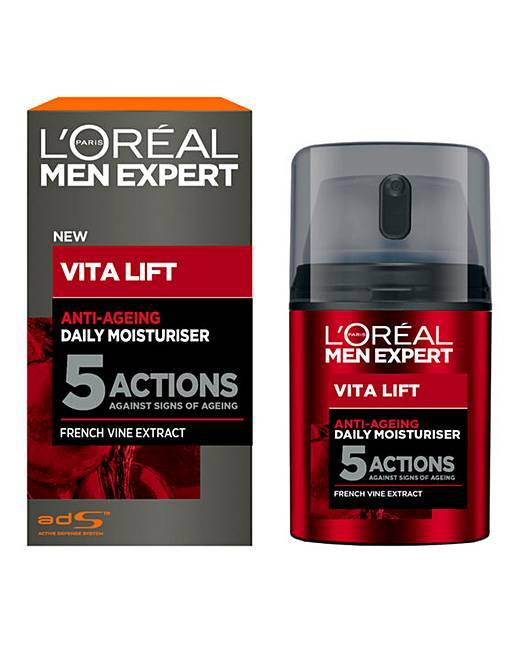 Discover L'Oreal Men Expert Vita Lift Daily Moisturiser designed for men's skin to fight against the 5 signs of ageing. This daily moisturiser has 5 anti ageing actions in 1 step: 1. Wrinkles look smaller 2. Skin is moisturised 3. Skin radiance is enhanced 4. Skin feels firmer 5. Skin is protected against daily aggressors and feels comfortable. Enriched with French Vine extract known for its antioxidant properties which combat the signs of ageing, such as wrinkles and fine lines, while peppermint extract reinforces skin's defence against daily aggressions. After use your skin will feel fresh, smooth and hydrated. Non-greasy, non-sticky, fast absorbing. Apply daily to clean skin on the face and neck, morning and evening. Can also be applied after shaving. Avoid eye contour area.